We tend to eat chips as an occasional treat from our local chippie. I’m not sure I’ve ever eaten them three times in one week before. But when you can air fry them with just a teaspoon or two of oil and they turn out to be as delicious as these rosemary chips, they are very hard to resist. As you might have seen from my post last week, I’ve been trying out the new Optimum HealthyFry from Froothie. Well you can’t test a fryer without making chips – can you? That’s my excuse and I’m sticking to it. As well as three batches of rosemary chips, I’ve also made sweet potato fries and a chocolate cake. Yes really! A chocolate banana cashew cake to be exact. 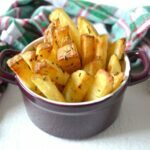 You can read my Optimum HealthyFry air fryer review in my previous post, but here I’m giving you a very simple, but effective recipe for rosemary chips. You could make these in a conventional oven, but making them in this air fryer not only gives a delicious crispy result, but saves on both time and energy. Chips for one took 18 minutes including warm up time and chips for two took 21 minutes. I find heating a large oven just to make a few chips rather extravagant and a bit of a waste of electricity. Many of the nutrients found in potatoes are held in their skins, so it’s rare for me to peel them. These rosemary chips are crispy on the outside and fluffy on the inside and the skins barely noticeable. I really like the combination of fresh rosemary and potato; luckily, rosemary is one of the few herbs I manage to grow in the garden. This along with a tiny amount of olive oil and some salt and pepper complete the ingredients. The possibilities for flavourings are endless; rosemary and garlic salt is pretty hot as is chilli salt. 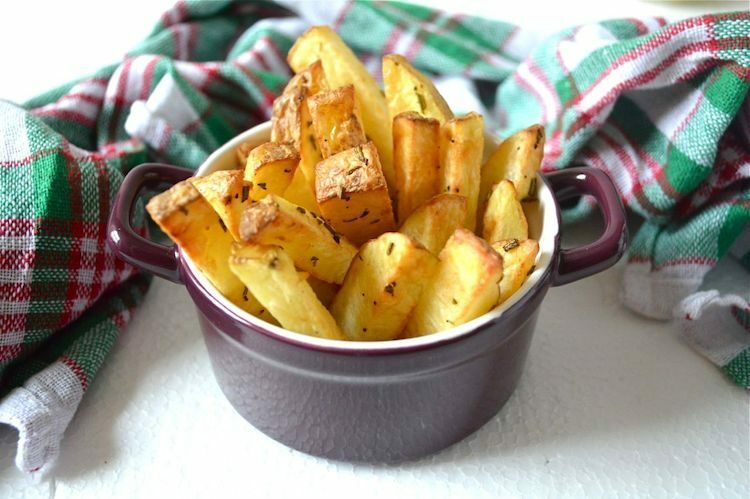 Air fried chips flavoured with rosemary. They're crisp on the outside, fluffy on the inside and quick to make. Cut the chips into fairly chunky chip size pieces, keeping the thickness as even as possible. Heat the air fryer - I used the Optimum HealthyFry. Place in a bowl with the remaining ingredients and mix until the chips are thoroughly coated. Place the chips into the air fryer basket and set to 200℃ for 15 minutes. Turn the chips half way through the cooking time. Scale up the quantities as necessary. Thinner cut chips may need less cooking time. Use flavoured salts for added interest - garlic salt works well as does chilli salt. If the chips stick to the bottom, use a silicone spatula to try and turn them. No air-fryer? Bake in the oven instead. You may need a few more minutes. I’m sending these rosemary chips off to the brand new linky One Potato Two Potato with Family Friends Food and Utterly Scrummy. If you fancy creating some healthier ‘fried’ food meals, why not jumpstart into the New Year with the Optimum HealthyFry Rapid Air Fryer? Or if that doesn’t do it for you, Froothie has plenty of other appliances to make eating a healthier diet that bit easier. You can keep up with the Jumpstart 2017 campaign by following me and other Froothie Ambassadors via the hashtag #Jumpstart17 on Twitter, Facebook and Instagram. As a Froothie Ambassador, I can offer Tin and Thyme readers free P&P on any Froothie appliance. Add 2483 free ambassador delivery to the comment box when ordering to get free postage and packing. Delivery will be credited back onto your card. The Optimum HealthyFry is currently on offer at £149. Thanks for visiting Tin and Thyme. If you make these rosemary chips, I’d love to hear about it in the comments below or via social media. Do share a photo on social media too and use the hashtag #tinandthyme, so I can spot it. For more delicious and nutritious recipes, follow me on Twitter, Facebook, Instagram or Pinterest. Like this recipe for rosemary chips? Why not save for later? The post contains affiliate links. Buying through a link will not cost you any more, but I will get a small commission. This helps keep Tin and Thyme blithe and blogging. Opinions are, as always, my own. These sound divine and this sounds like an excellent bit of kit – I am an unashamed chip lover! Chips are very hard to resist, but at least I can tell myself these ones are healthier than most. Who am I kidding? Ooooh yes please, I adore rosemary with roast potatoes so I’m imagining these are incredible!!!! I used to have an actifry but I rather wore it out, so am very tempted to try the new frothie air fryer as i’m sure the boys would love having chips on the menu on a regular basis! They look very crisp! Now I am tempted to get a air fryer too! Haha Angie. They make very good chips and this one bakes a mean cake too, but there’s a lot of temptation there. I am obsessed with air drying chips – they always come out so perfect. I am going to have to add rosemary next time too. I’m so impressed with how good the chips are, but I’ve got to stoooooopppppp!!! I would eat chips every day if I had half a chance! Yes, I might have to put the fryer away – it’s too too tempting. Sounds very delicious. Rosemary and potatoes go well together. That reminds me to put back some rosemary in my kitchen. I love the idea of fresh chips only taking twenty minutes to make and using a tiny bit of oil too! Ad if you don’t have to heat the whole oven either, I’m there! Excellent chips and no need for the oven are the top selling points I reckon Lucy. I now want rosemary chips for breakfast! The HealthyFry looks great. Chips for breakfast sound highly decadent Jan, but somehow rather appealing. I’m torn Dora. The Optimum HealthyFry is fab and can be used for a lot more than just wonderful chips. But it does take up precious counter space – dilemma! Rosemary chips; such a good combo! These sound utterly scrumptious – in fact I could do with a plateful RIGHT now! They are very moreish indeed and I’m trying really hard not to have them too often! I think rosemary chips are my favourite kind of chips. This air fryer sounds fantastic! I never peel potatoes but that’s because I’m lazy. I can’t stop using my air fryer – it’s great! These look amazing, I love chips so will have to try cooking them with this method. The chips are pretty special, even done this way. Trouble is, I can’t stop making them. Gosh, these look perfect! I love rosemary and potatoes together anyway but as chips? Oh, yes please! I’ve never used an air fryer but I suspect that if I had one, I might be making chips with everything! Ha ha! Rosemary chips, what a perfect combo Choclette! I wish I had a airfryer. You can’t beat homemade chips for a treat. I have been impressed by how easy the air fryer is to use. Yes, I must remember they are only a treat!!! The air fryer is really easy to use and I love the way it heats up so quickly too. I’m so excited about these chips in the HealthyFry. Can’t wait to try your recipe as I just adore rosemary. Gosh this is a great way of making chips. I make my own in a traditional way but this is really interesting! i’ve been using my air fryer almost constantly since I first got it. It acts as a mini oven so is great for when you’ve only got small (ish) quantities to cook. I even made my 2nd cake in it this week.